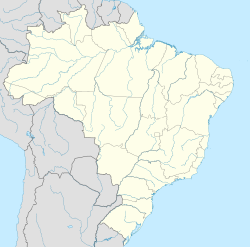 Guimarães is a municipality in the state of Maranhão in the Northeast region of Brazil. It was founded as New Guimarães (after Guimarães, Portugal) in 1758. The municipality contains a small part of the Baixada Maranhense Environmental Protection Area, a 1,775,035.6 hectares (4,386,208 acres) sustainable use conservation unit created in 1991 that has been a Ramsar Site since 2000. This page was last edited on 19 March 2017, at 15:17 (UTC).